The XPOWER B-24 Heated Force Dryer gives you the power of heat to dry those pets even faster. The variable speed control along with dual heat settings gives you complete control over the amount of air and temperature you need to dry any dog, small or large with short or long hair. Like all other XPOWER dryers, the B-24 is extremely lightweight and up to 40% quieter than other dryers in the market. Its rugged ABS housing makes it super durable and the filter system keeps debris out of the motor for maximum efficiency. The B-24 is compatible with our wall or stand mount kits letting you put your machine wherever it is most convenient and secure. 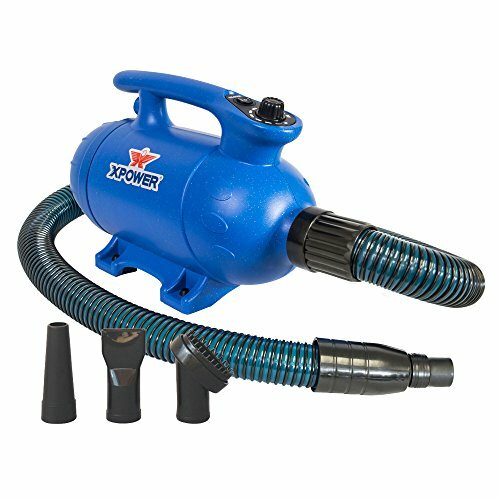 Product Features: Powerful and Energy-Efficient, Super Lightweight and Compact, Remarkably QUIET Motor, 2 Heat Settings, 3 Washable Filter Sets, 6' x 1.5" Flexible Heat Protected Nylon Hose, Thermally Protected, 2-Speed Control Switch, Durable & Rugged ABS Housing, 1 Year Limited Warranty, Wall or Stand Mount Optional, 3 Nozzle Attachments (included) Specifications Volt/Cycle 115 V/60 Hz Power 3 HP Electrical Use 14 Amps (at highest heat level) Speed Control Variable Speed Airflow 150 CFM Cord Length 10 ft. Hose Length (Diameter) 6 ft. (1.5" D) Housing ABS Unit/Box Weight 8.8 lbs./10.1 lbs. Unit/Box Size (Inches) 14" x 6.3" x 9.2"/17.7" x 9.8" x 9.6".